Artist Dan Holdsworth has dedicated the last five years to realising two major bodies of work, both of which receive their public premieres at Northern Gallery for Contemporary Art in 2018-19. The first, Continuous Topography, investigates the limits of what constitutes a photographic ‘object’. Since 1996, the English artist-photographer Dan Holdsworth has explored the “extreme” territories that characterize humans’ changing relationship to the ‘natural’ world in the Anthropocene. 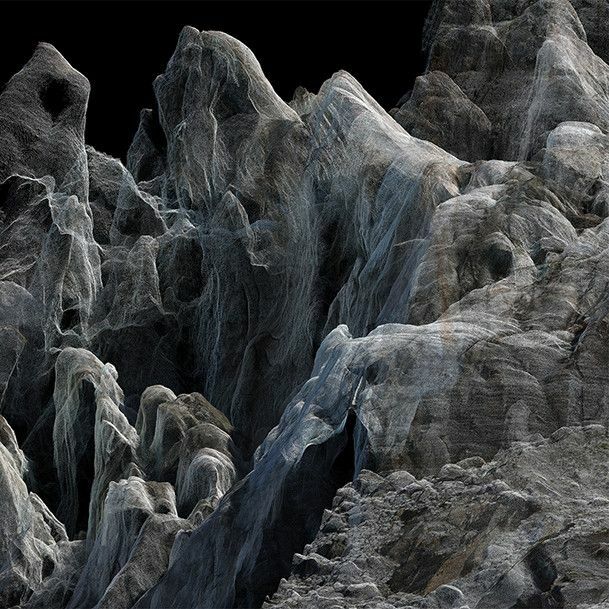 Since 2012, the artist has worked alongside academic geologists to map the exact contours of Alpine glaciers and rock formations, by using drones, lasers, photography, and high-end software ordinarily employed by the military and climate scientists. The result is the series Continuous Topography, consisting of images created from millions of points marked in space, each a millimetre-perfect registration of the precise contours of a rapidly changing landscape. This landscape is the Argientière glacier in the Alps. Indeed between the recording of the landscape, and its presentation as artworks made to be conserved in perpetuity, the landscape has already begun to change beyond recognition. Continuous Topography creates an image of what Holdsworth calls a “future archaeology”. What we encounter are not only three-dimensional maps of places characterised by extraordinary natural beauty, but historical records: records that document the very shape of the world that we have to lose. The works are entirely new kinds of landscape imagery, which invite us to imaginatively inhabit what initially appears to be an almost entirely abstract and immaterial, indeed spectral virtual space. Encountering these works is to see Europe’s most sublime landscapes – Alpine mountain ranges that artists have worked to picture since the Romantics – in an entirely new way. These are works that have been painstakingly constructed from data that the artist has personally gathered through weeks and months of fieldwork traversing the Alps. The exhibition reveals the first moving-image works the artist has created, after working for 20 years with large-format analogue cameras. It focuses on a sequence of large-scale digital animations that are both maps and composite photographs. Each is projected at a monumental scale, enveloping us into a new type of space. In each, we travel on a ‘flythrough’ around and even into an Alpine landscape. Each offers a sublime superabundance of visual information: a virtual sublime, we might say, beyond the capacity of the human eye to process. These works offer a kind of hallucinatory realism that the pre-Raphaelites could only dream of, in the campaign to create an art characterised by its truth-to-nature, and a fidelity to recording the organic world in its every detail. What is startlingly new here is the degree of precision that the process of ‘photogrammetry’ offers. The astonishing quantity of detail that we are confronted with allows the artists to transform raw ‘data’ into a new type of poetry. Each pixel has the colour of the ‘real’ snow, ice or stone in the landscape, making these works a new, strange type of image. The project is accompanied by a major 280pp monograph entitled Mapping the Limits of Space, surveying Holdsworth’s career, published by Hatje Cantz.